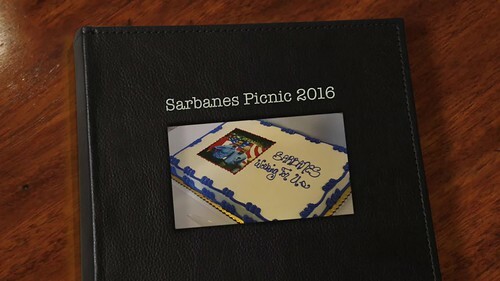 Thank you so much to everyone who came out to the Sarbanes Family picnic. My dad and I were happy to see so many good friends made the trip out even in the rain! We look forward to doing this again. Rep. John Sarbanes will serve on a conference committee charged with reconciling the vastly different opioid addiction bills passed by the House and Senate, offering him an opportunity to help address one of Baltimore's most intractable problems. Sarbanes, a Baltimore County Democrat who represents portions of Baltimore City, was named to the conference committee Tuesday by House leaders. The five-term lawmaker was one of the few Democrats to shepherd a bill through the House last week intended to mitigate a national increase in heroin and prescription drug overdoes. Due to the rainy forecast we have moved the location of the picnic indoors to Ridgely’s Run Community Center. Directions: From 95 take exit 41 towards MD 175 E/Jessup. Turn right onto US-1 South. Turn Right onto Mission Road. The community center will be on your right, look for the blue and white Sarbanes signs. My dad and I are looking forward to seeing everyone on Saturday! On Wednesday I had the opportunity to be on WYPR’s Maryland Morning. Click here to hear my interview with Tom Hall. Thank you to everyone who voted for me to be the Democratic nominee for Maryland’s 3rd Congressional District. I am proud to serve the people of Maryland and look forward to continuing to work hard for you. Last night I was able to stop by the Light City Neighborhood Lights installation in Hampden, which is located in the Third District. Below is my interview with MICA faculty member Diana Reichenbach who put together an amazing interactive community art piece. Light City is kicking off this week in Baltimore and I am very excited for all of the various parts of the third district (the Inner Harbor, Harbor East, Little Italy, Fells Point, & Hampden) that will be participating! Baltimore was the 1st city in America to light our streets with gas lanterns proving that we’ve always been a city of innovators! I am excited to see an event come together that will show the rest of the country why so many young people and start ups are starting to call Baltimore home. If you'd like more information on Light City click here to see their full list of events! Thank you to the Maryland and District of Columbia AFL-CIO for endorsing my bid for re-election. I am proud to be part of the labor team. We need to make sure that the issues which affect working people are front and center during this election cycle. I am happy to announce that I will be running for re-election in Maryland’s 3rd Congressional District. Click here to read the entire annoucement. "This will launch an educational partnership around the Star-Spangled Banner National Historic Trail," Sarbanes said. TTEC aims to educate students about the state's role in the War of 1812 by getting them out of the classroom and onto historic sites. Now, our nation's leaders are calling it a public health crisis that has reached epidemic proportions. It is getting so bad that it is getting attention from Hollywood to the halls of Congress. Even the president is getting aggressive in the fight. Click here for to continue. Click here to read my statemnet on why I am strongly opposed the decision by the Montgomery County Board of Elections to close the Marilyn J. Praisner early voting location. Eariler this week Secretary Hillary Rodham Clinton released a Proposal to Restore Integrity to American Elections. Secretary Clinton’s effort to fight big money in politics is a robust and comprehensive policy proposal that will put our democracy back into the hands of everyday Americans. By amplifying the power of small donations and enabling every American to have a voice in our government, we can curb the undue influence of big money in politics and return to a government of, by and for the people. I applaud the Secretary’s commitment to this issue and believe there’s no better candidate to advance reforms that strengthen our democracy. Listen to the first episode of The Sarbanes Signal. To learn more about the show and sign up for alerts click here.